PCI is your connection to the powder industry. Connect with potential customers and industry professionals. Visitors can locate job shop, custom coaters, suppliers, manufacturers and consultants. Check out our Powder Coated Tough Buyers Guide. 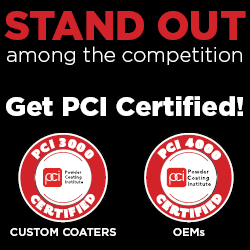 PCI members lead the way for the powder coating industry. To view our members, please click the category below to search our online members database or to search for a coater or search our member directory by company name or location. A company who manufactures and sells equipment used in the powder coating process, i.e. test panels, masking materials, gauges, hooks, racks, nozzles, etc. A company who services in a consultant capacity to the powder coating industry, i.e. research, market data, business development, etc. An Original Equipment Manufacturer is a company that manufactures products to sell to retailers or to other manufacturers, i.e. farm equipment, grills, household fixtures, etc.